This entry was posted on May 29, 2015 by Jessica Anderson. Sublimation is the hottest technology in the awards industry. This plaque looks eye-catching in full color! We are excited to announce a new technology for creating awards - Sublimation! While the technology isn't really new, as we've been using it for years, the quality and price has recently improved substantially. What is great about sublimation is that this process allows us to create nearly endless possibilities of awards and gifts. 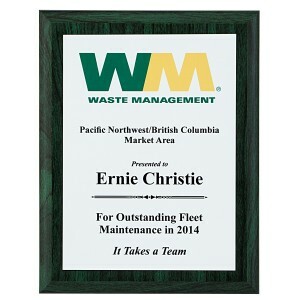 Each sublimated award is full color and completely customized to our customer's need or event. Available sublimated items are numerous and expanding; our suppliers continue to offer new and innovative products that we can bring to market. Sublimation uses ink, heat and pressure to transform an item. Using a sublimation printer, an image is printed on special paper. This paper is then placed on the product and heated in a high pressure press. Through this high heating, the ink changes from solid matter to gas, where it permeates the product, creating a full color image. Sublimated inks can't be washed off, as they actually bond with the substrate. What Items Can Be Sublimated? 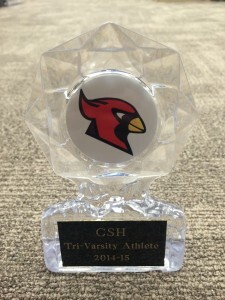 Sublimated trophies are awesome for schools, as the mascot can be placed on the insert! Have a unique idea? Make it a reality with sublimation! Want to learn more? Email me at [email protected] to discuss your project.